Why can’t I select the date I want for my booking? It is likely that the bus is already sold out for that date. Make sure to call to be put on a wait list as people do cancel! How can I tell how many seats are left on a bus? During the booking process at the step where you select your depart or return date, hover your mouse over the desired day and the number that shows up is the number of remaining seats. You may also always call the office. 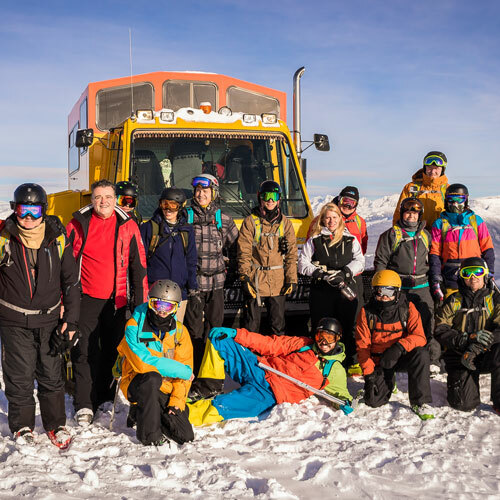 MagicBus Tours provides exclusive day trip service to Marmot Basin throughout the season. We also do a variety of annual trips called “Weekenders” and the destinations usually include Panorama, Revelstoke and Fernie. If you wish to ski elsewhere we can produce a group tour for you to fit your needs for 40 or more people. When is the latest I can book my trip? MagicBus advises that all patrons book as soon as possible as we do sell out our buses. If you book your overnight trip the day prior to departure or during holiday season, please note that this does not guarantee hotel availability. You must receive a confirmation e-mail from us to verify that your trip is official. Otherwise for day trips, if there is availability you can book late the night before. Can I show up at the bus and pay the morning of a tour? We do not recommend this; however, this will be up to the discretion of our Tour Director(s) provided there is even room on the bus. Tour Directors can only accept cash and there will be no change available. I have my own lift ticket and want to use your transportation, can I do that? Yes, you can find the “transportation only” rate here. To book this, go to our BOOK NOW page and on step 5: Lift Tickets, select the option “pick and choose”. Here you may un-check the required lift tickets for each person. We offer a discounted transportation only rate for seasons pass holders and Marmot Escape Card holders. Can I use multiple Boarding Passes to book my trip? That’s a tricky question, but yes. You can enter a maximum of ONE boarding pass code per person on the online booking form but if you wish to redeem more towards an overnight, you must call into the office to make this transaction. I have a Boarding Pass from LAST season, is it still valid? Yes, punch in the ID# on the pass into the online booking form in the PromoCode area to redeem it. If the Boarding Pass was issued as a trip credit, it is only valid for the season it was issued. What do I do if I want to book my trip and don’t have a credit card? Our online booking process now accepts visa debit cards! You can also come into our office during our regular scheduled hours and can pay with cash or debit. See our office hours at the bottom of the page. I have a credit, how can I redeem it? All credits will be valid only for the season they are issued and can be redeemed over the phone anytime during regular scheduled office hours. You may be given a Boarding Pass/PromoCode as a credit. Can you tell me specific rates? Sure! Go to MagicBus Rates for all the seasons rates. Prices are per person and in Canadian currency. Youth / Junior / Child overnight rates are only valid with a purchased Adult trip. When I book an overnight trip, is transportation to the hotel included? After your first day skiing the bus will drop you off at your hotel. The following morning however, you must arrange shuttle transportation to the resort. Please ask the MagicBus Tour Director or the hotel front desk for shuttle times and rates. Are there any other pick up/drop off locations outside of Edmonton? Yes, we can pick you up in Edson if you are going to Marmot Basin or in Red Deer if your trip departs from the Sawridge. Please change your pickup/drop-off location category in the online booking form. What are the rates for a group? Group rates are based on 40 people and can be more or less depending on your needs. It also depends on the time of the season, how many days, which day of the week, where you want to go and so on. If you require a rate, please fill out this form with all the details of your request. Can someone under the age of 18 years old book an overnight stay? No, by law anyone booking an overnight must be of the legal age limit. What is the minimum or required age to ride the MagicBus for the day? Passengers 12 and under must be accompanied by a responsible person at least 16 years of age. That being said, all passengers under 18 will require their parent or guardian to sign the waiver form that is supplied after booking. I’m stuck on the processing screen, now what? Your session has timed out and most likely the trip was not processed. Please contact the office during regular scheduled hours to double check, otherwise please book again and notify us of the problem so we can ensure you are not charged twice. I haven’t received confirmation for my trip yet, why? There could be a chance that there was an error with inputting your e-mail address. If you have booked an overnight trip, it is likely the hotel has not yet confirmed the availability. Contact us at the office if you’re getting close to your departure day and we’ll gladly sort it out. Refunds are available for all day trips with 48 hours notice before departure and overnights require 7 days notice before departure. Refunds will not be available to those who miss the bus. Set alarms! Yes, MagicBus requires about 20 people booked on our motor coach to launch a trip. Any less than that is not economically feasible or environmentally responsible. You will be notified promptly if a tour you are booked on is cancelled with the option of a re-schedule or full refund. Where is the best place to rent my gear? Rentals can be done on mountain or in Edmonton at local ski shops such as PaceSetters (10054 167 Street) or Sundance Ski & Board Shop (10423 79 Avenue). We recommend renting locally to maximize your time on the mountain! Our tours are family friendly and do not allow alcoholic beverages onboard so we encourage you to leave those at home. Can I bring food and beverages on the bus? Yes you may bring your personal food and non-alcoholic beverages on board but please keep the bus free of litter. The Tour Director(s) will come down the isles several times to collect garbage and bottles. Where do I park when I meet the bus in the morning? Do I have to sign in with anyone before my trip? Yes, please check in with the Tour Director prior to jumping on the bus. They will be in the vicinity of the motor coach and the building doors. Do we need to have the supplied waiver completed before boarding the bus? For those under the age of 18 that will be riding without their parents, they will need to either have a waiver form filled out prior or have their parents sign the morning of. All those patrons over the age of 18 can fill out the waiver form the morning of. You will be sent a link containing the waiver form along with your booking confirmation or download it here. Can we leave items on the bus during the day at the hill? Yes, you can leave anything on the bus. The bus will be locked but all items left are still at your own risk and you will not have access to it during the day. The bus will be departing the hill after dropping everyone off and returning for pick up. Yes, they are called boarding passes or PromoCodes and can be purchased online or in person at our office Suite 902, 11834 Kingsway Ave 9th Floor, East Tower, Edmonton. We can also make custom gift certificates of any dollar value, just give us a call. If one of your questions or concerns is not listed above you can try searching the entire site with specific phrasing in the “Find Your Way” search bar on the side of the screen (down on mobile). You may also contact us and we will get back to you as soon as possible!